I always love it when new products are released, particularly when they are so popular that they quickly become a Best Seller on Amazon, which is exactly what this powerful anti-aging eye gel has done. 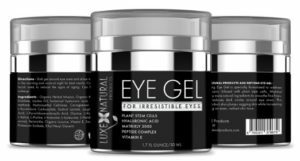 This lovely eye gel is created by Luxe Natural Products who are committed to producing natural, organic products that give noticeable results. None of their skincare products contain any harsh toxins or chemicals, they are free from parabens, cruelty free and ideal for sensitive skins. What does the Luxe Natural Products Eye Gel do? As we age, most of the problems we come across with the delicate skin around our eye area are concerned with wrinkles, fine lines, under eye bags, puffiness and dark circles. So it is wonderful to find a skin care product that addresses all of these problems, is made from all natural ingredients and is loved by customers as well. Even better, this luscious eye gel is formulated with the most advanced natural ingredients on the market to produce irresistible eyes. This all-natural eye gel helps to reverse the signs of aging around your eye area and give you back a more youthful appearance. It contains hyaluronic acid for super hydration and a boost in collagen, Matrixyl 3000 to firm and smooth your skin, peptides for cell renewal and vitamin E for a rejuvenative boost that fights free radical damage. Hyaluronic acid: This is a fabulous ingredient for dry, dull or tired looking skin, as it delivers a super pulse of hydration into your cells, adding oodles of moisture and making your skin feel much more softer and smoother. Hyaluronic acid is also vital for the production of collagen, so you have the added benefit of more moisture and more plumping of your skin around the eyes. This reduces your fine lines and wrinkles and gives your eye area a more youthful appearance. Matrixyl 3000: This is a relatively new ingredient on the market that focuses on boosting collagen and repairing DNA. Matrixyl 3000 is a combination of two different peptides called palmitoyl-tripeptide and palmitoyl-oligopeptide that work together to stimulate the production of collagen and elastin in your skin. Recent research in 2013 has shown that Matrixyl 3000 can actually double the amount of collagen in your skin, so this is a fabulous ingredient all on its own! Plant stem cells: These have remarkable properties and can help to promote the regeneration of your skin’s cells, assist the adult stem cells to live longer in your skin and delay the effects of aging on your skin, keeping your skin looking younger for longer. Peptide complex: Peptides are great ingredients to have in your skin care products and this lovely eye gel doesn’t just have Matrixyl 3000, but it also has another complex of peptides as well. Peptides are not miracle workers, but they do help in cellular repair and renewal and also assist in stimulating the production of collagen, plumping up your skin and giving it a more radiant, youthful look. Vitamin E: This is one of the most powerful antioxidants, helping to reverse the signs of aging in your skin caused by too much exposure to the sun. It helps to reduce pigmentation problems, improve the texture of your skin, adds moisture and leaves your skin feeling softer and looking fresher. What are customers saying about this anti-aging eye gel? Customers love this eye gel, because it is packed full of awesome ingredients and is so very affordable! They like the fresh smell of this eye gel, that it feels really light and isn’t sticky at all, also the pump action delivery system is very popular, as this makes it easy to use without dipping your finger into the jar. As I was reading though the online reviews for this eye gel, the vast majority I saw were from customers who either received this eye gel free or at a discount, in return for giving a review. As this is a fairly new product, it is reasonable that the Luxe Natural Products have given discounts to their customers for these reviews. The reviews below however, are from customers who were not asked for a review, instead they were from full paying customers. So far, after only a week, I have noticed a difference in my under-eye circles. I am loving this eye gel! It dries without leaving a residue and I feel like it helps brighten my eyes, aka it rejuvenates those bags from raising two toddler boys! This eye gel has helped so much! I apply it at night and in the morning and my eyes are no longer puffy and i have noticed that the area around my eyes looks brighter and not as dark as before. Upon using it for a couple of days (morning and night), I noticed some serious lightening of my dark under eye marks. Impressive enough that I had to confirm with my coworkers and they agreed! You use it 2 times a day and start getting the results so fast you can even where it under your makeup and it does not clump up and look all matted together. I love this. Can’t wait to try more of the products. 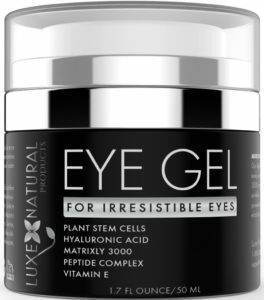 This eye gel has all of the ingredients you want in a good eye gel with hyaluronic acid, Matrixyl 3000, Vitamin E, plant stem cells and even more peptides. It is not sticky or gluggy, goes on smooth and the pump action delivery system makes it easy to apply the right amount to your eye area. Customers so far, love the results of using this eye gel with no-one having a bad word to say about it. Since it is so affordable (less than $15), it is definitely worth investigating. To read my hyaluronic acid serum reviews, click here.